HEALTH Infrastructure has confirmed the landowners of the Tweed Valley Hospital site at Cudgen attempted to block the acquisition of the land in the NSW Supreme Court. A Health Infrastructure spokesperson said an application was made by the landowners last Friday seeking an injunction from the Supreme Court to delay the acquisition of the land. Duane Joyce, who purchased the 22-hectare property for $2 million in 2010 with business partner Kerry Prichard, had the case heard in Sydney's Supreme Court on Tuesday. A Health Infrastructure spokesperson confirmed the application by Mr Joyce was rejected. "The Judge concluded the application "was doomed to fail" on the basis that the NSW Government had followed the correct and appropriate processes in making genuine attempts to acquire the land through negotiation with the landowners from the time they first offered their land for hospital purposes in late 2017 in their EOI," the spokesperson said. "Justice Fagan dismissed the application and ordered the landowners to pay costs. The land required for the new hospital campus transferred to the NSW Government, with an Acquisition Notice published in the NSW Government Gazette on 2 November 2018." NSW Health Minister Brad Hazzard previously told the Tweed Daily News the owners wanted a price "far, far above" what the land was worth. 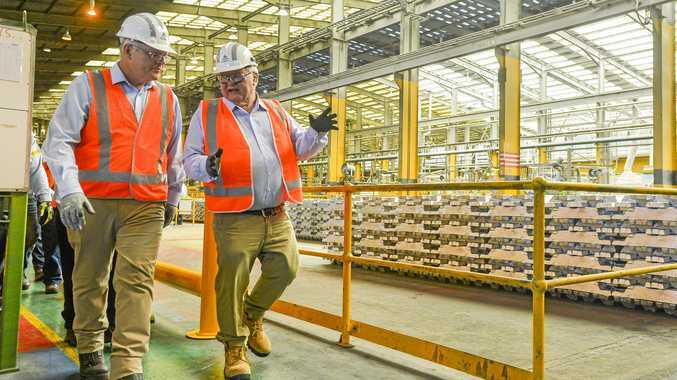 It is understood several offers were tabled to Mr Joyce and Mr Prichard in the past months before Mr Joyce sought an injunction just days before the acquisition process was set to end. According to a judgement ruling, on February 5 negotiations took place between the two parties where the State Government offered "$2.5 million to $3 million" for the land. However, Mr Joyce and Mr Prichard said they would require a price "in the early $30 millions". Further negotiations took place which saw the landowners ask for a total of $15 million with a non-refundable advance of $12.5 million. On September 18, the landowners "rejected the possibility of any further meeting to discuss or negotiate the acquisition." The rejection was "inferred to mark the end of the period of potentially constructive discussion". It is understood a price was later agreed between the $4m and $15m mark. THE site of the new $534 million Tweed Valley Hospital has been officially purchased by the NSW Government. According to the NSW Gazette website, the site was purchased through the compulsory acquisition process on Wednesday. 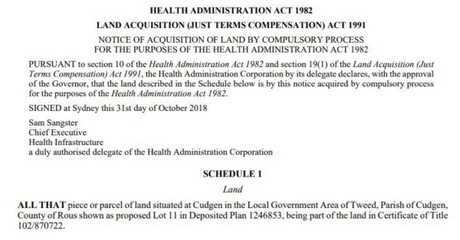 "Health Administration Corporation by its delegate declares, with the approval of the Governor, that the land described in the Schedule below is by this notice acquired by compulsory process for the purposes of the Health Administration Act 1982," the website reads. The statement goes on to say the title of the Cudgen site had been transferred over to Health Infrastructure. The Tweed Valley Hospital site has been purchased following months of negotiations. 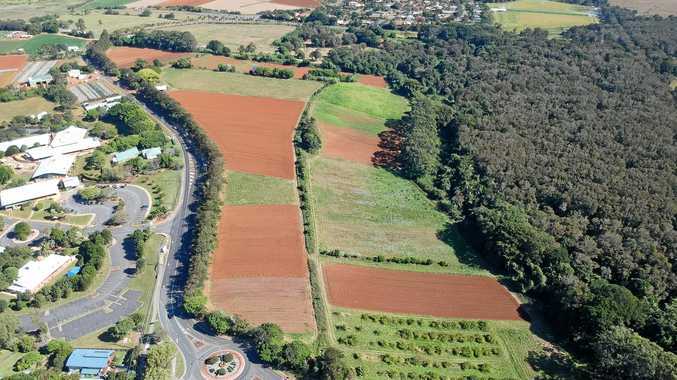 It is understood the owners of the site had been locked in negotiations over the price of the land and attempted to block the sale in the NSW Supreme Court on Tuesday. The court ruled in the State Government's favour, with the owner forced to pay the legal costs to Health Infrastructure. Works on the site are expected to begin in the next week.